-Before her mission, she was extremely nervous to the point of not being able to fight back to bullies. -She's more indecisive than Emerald when it comes to buying clothes. -She and Ben became close friends during freshman and he was the reason that made her stop from killing herself. -When she first came into my class, she was extremely nervous and shy. She would always shake uncontrollably when she gets very nervous and she always stutter when talking to other people. This was because of Kelly who bullied her and traumatized her, leaving her into this nervous and depressed state. While she hid it, she's extremely depressed to the point where she had tried to kill herself more than once. But, after her mission, she began to show her old self. After her mission, she became more confident and she can actually talk properly. 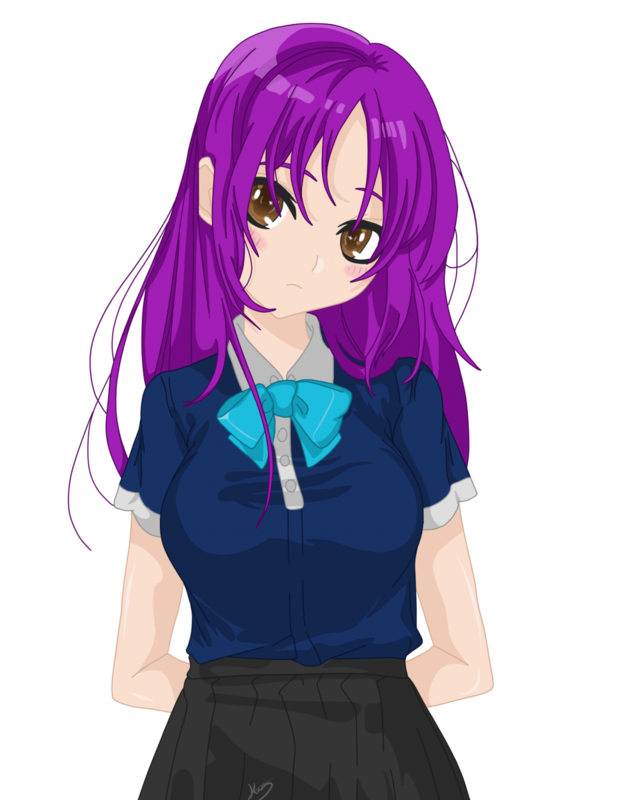 She is quite friendly and supportive to her other classmates, trying her best to help her friends out. "Before I obtained my confidence, I was ready to face death! I was ready to die because no one ever loved me! My parents? Sure, they only care about me when it's in their interests! The closest person that loved me was Steve and even then he betrayed me. But when I regained my confidence and I saw that two people will love and care for me, I don't want to die anymore! I've regained faith in the world and I feel much more.... well..... confident about what I can do and can't do! It's a little cliche now but, I also want to live with Steve and Joseph. I really can't choose between the two and I think they're not bothered by it, I think they'd rather have it the way it is rather than anything else. I'm glad you stayed long enough to hear my thoughts, sir, but I need go now. Thanks again for hearing me out!" Yeah she is, she just doesn't want to admit it lol.